Malcolm X was born Malcolm Little in Omaha and grew up in Lansing, Michigan, where white supremacists burned his house down and, later, murdered his father. Malcolm Little embarked on a career as a petty criminal, was sentenced to prison for burglary, and, while in prison, became a convert to the Nation of Islam (“Black Muslim”). Rejecting his “slave name,” he called himself Malcolm X. He became a Black Muslim preacher, but, even more, emerged as a charismatic and electrifyingly eloquent speaker on black pride and black nationalism during the early 1960s. His rhetoric was angry, and he presented a dramatic contrast to the non-violent approach of Martin Luther King, Jr. At first unwilling to reconcile with white society, he became increasingly amenable to the coexistence of the races as he matured in his Muslim faith. 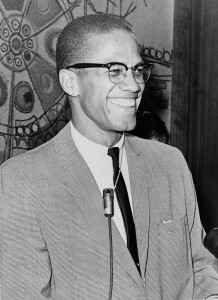 He was, however, gunned down by Black Muslim assassins on February 21, 1965— but not before he had written (with Alex Haley) The Autobiography of Malcolm X (1965), a book that made him a role model and hero to a generation of African-American youth.